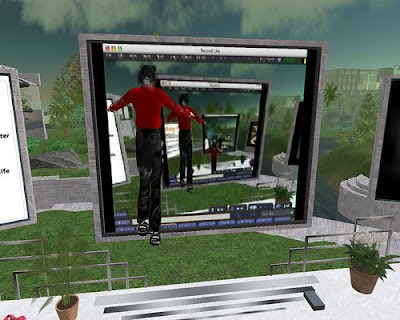 Email received on May 15, 2008 - WGBH 89.7 Presents a Virtual First on May 27 with Live Second Life® Concert Event. On Tuesday, May 27 at 11am, WGBH 89.7 will embark on one of the more innovative classical music events in recent memory when pianist Jeremy Denk performs a concert in the WGBH Fraser Performance Studio that will simultaneously broadcast live on air, on the web, and in the virtual online 3-D world, Second Life®. Overgrown Path August 14, 2007 - Next month, a British orchestra will stage the first full-scale symphonic concert on Second Life.The Royal Liverpool Philharmonic has created a virtual, 3-D version of its concert hall and on September 14 users of the website will be able to attend a concert led by the orchestra's chief conductor, Vasily Petrenko. Ah, I get it, it's a virtual first. Or perhaps this is a record? It will certainly be interesting to have a major classical radio station like WGBH involved in presenting classical concerts in Second Life but they are far from the "first". I have been in Second Life for two years. My avatar's name is Kate Miranda. Kate is an officer of two of the biggest classical groups in SL and coordinates a concert series on Music Island. I presented on my work this month at the Technology in the Arts conference at the University of Waterloo.